Wow, thank you for contributing so eagerly to the Practice Daily Card Readings and also for coming to the aid of a Tarot Student who is in a bit of a bind at present and having difficulty with certain Cards that keep popping up. Well done everyone. This Reading is a current real-life scenario and not the normal free-style dramatic versions we have been working with in the Daily Two Card Readings. Yes, this is a real dilemma. 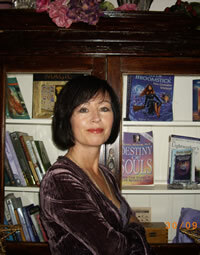 The Tarot Student has been following all your interpretations and theories very closely. I was asked to post this message to all of you on their behalf. So there is a possibility that these Cards will be added to or as I suggested, a Reading done based on The Seven of Cups and The Eight of Swords to determine why they keep coming up and how to find a way out of all those Swords. The message is posted below. When my site is completely ready to switch over to WordPress.org I will be installing a plugin that will allow for a Forum. You will then find it much easier to share your card readings, interpretations, discussions and network. With Regards to Daily Card Reading Practice, here are two, Billy my partner pulled yesterday. Remember, he is still on the trail of property hunting following the disappointment of The Dream House in Dingle failing the Survey Engineer’s Report. I have asked him to share his own interpretation of these in the comments section of this Post today. I already have my own theories. You are also welcome to offer your opinions too if you wish. But before you do that, I want you to take into consideration one of his Daily Card Readings from last week, which you will find further down the Post. While he was waiting for me at my WordPress.org training last week, he decided to go for a drive to a coastal town that was nearby in Greystones, County Wicklow, Ireland. It was his birthday that day and the sun was shining. He went for a walk on the beach, strolled around the seaside town and had a cappuccino outside a quaint little coffee shop. He had a lovely time and did a little bit of exploring. When he picked me up a few hours later, he was gushing about how beautiful Greystones was and how he had looked in some of the windows of Estate Agents. He spoke of a couple of houses he had seen and how well they were priced. My goodness, I thought, from Dingle to Wicklow all of a sudden. On the drive home, he chatted about how convenient to Dublin, it was, with trains getting one there in a matter of minutes, yet still being in the County that is known as The Garden of Ireland in Wicklow, and beside the Sea too. We could pop into Dublin any time we wanted to go to concerts or the theatre. We would be ideally located. I listened and oohed and ahhed in all the right places, but to be honest my mind was on all I had learned at the training and worrying about how I was going to manage it all on my own. I was also exhausted from information overload. We went home and further discussed it over dinner and our usual glass of wine. The next morning Billy did his Daily Card Reading. He drew The Six of Cups and The Queen of Wands. He read up on their meanings but was unsure of how they were connected to him. I was quite busy working on my computer so did not have much time to give it a lot of thought. However, later in the day I called out to see where he was as the house was very quiet. I had been so involved in working on my new site I was unsure as to whether he had left the house or not. I wanted a cup of coffee and a break from the keyboard. I found him upstairs on his laptop looking at property websites. He was scouring through property for sale in Greystones and had already selected a few he intended to go and see. He certainly was spreading his wings a bit and being more adventurous with his property searching. I told him that the kettle was boiling so coffee would be ready, like now! Back in the kitchen, I passed the two Cards he had drawn and The Queen of Wands caught my attention. What are you doing there I thought but it struck me quite fast what was going on. 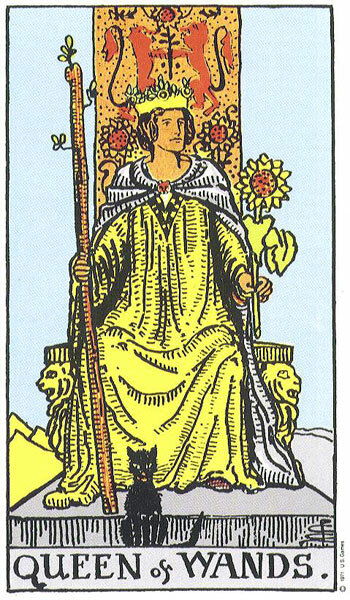 It was The Queen of Wands who was encouraging him to think outside the box and not restrict himself to the possible rose-tinted idyllic, romantic version he had of moving to Dingle. She was whispering to him about the benefits of being near to the cultural and historical city of Dublin. Reminding him of all the places he likes to go to and the things he loves to do. She was telling him that he might get a bit closed off in Dingle, lovely and all as it is, he might long for the buzz of the city. Could Dingle end up being too far away? I am not sure The Queen of Wands would like to be so restricted. She was getting him to use his imagination and open his mind to the possibility of other places to live. Places that would be fun and exciting, and still tick all the boxes. I saw her sitting beside The Six of Cups and felt a pang of sadness for Billy. 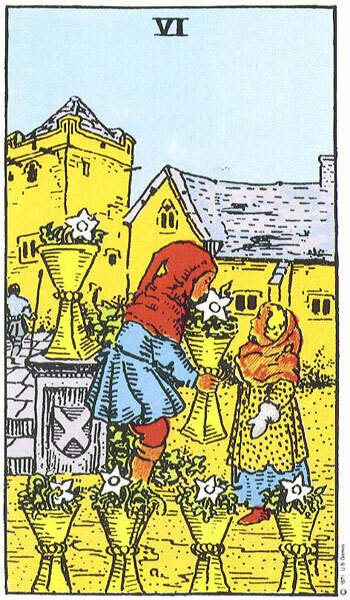 The Six of Cups highlighted how nostalgic he felt about Dingle. After all he had spent many, many, happy boyhood summers attending the Gaeltacht in Dunquin, Dingle where he learned to speak Irish fluently. He had fallen in love with it as a child, and since then has been trying to find his way back to it. He called it is his Spiritual Home and dreamed of retiring there. I too have my own connections and nostalgia attached to Dingle. It was my son’s favourite place on earth, the place he chose to spend his last holiday before he died from cancer in 2007. For many years too, I have also dreamed about moving to that wild Atlantic coastline where next stop is America. However, The Six of Cups sitting beside the bright and bold Queen of Wands made the imagery look quaint and cute. Would our coloured memories and desire for the dream, in reality turn out to be very different. The Dingle of today, may be very different to The Dingle of Billy’s distant boyhood memories. The Queen of Wands was certainly making him sit up and take a good look around at his other options, even encouraging him to think of buying overseas. Yes, Dingle remains the top of the list, but maybe there is somewhere else he should be looking too. I felt grateful for her presence and the influence she was having over him. I want him to make the right decision and for all the right reasons. We discussed the relevance of his Cards over coffee and he has decided to do as The Queen of Wands suggests. He will be a little more open and adventurous in the search for his dream home while keeping a tight eye on Dingle too. From now on, he, or should I say we, will be leaving our Rose-Tinted glasses at home when we go property hunting. Come on Billy, share your thoughts! Yes, this is a time of flux, uncertainty, change and frustration. The Daily Readings over the last period of time have been very pertinent to my life at the moment, with particular reference to my seeking a property to buy. The King of Pentacles sitting comfortably on his throne, secure and relaxed in the knowledge that all is well in his kingdom is almost the exact opposite of where I am at the moment. He reminds me that I need a calm and level-headed clarity to see me through this period. The Five of Wands inform me of struggle, but perhaps not in a negative way as, if you look at the card in a certain way, the five characters are assembling a Pentacle thus relating to the success enjoyed by the King ! Today’s cards were The Tower and Judgement. More to think about. Well done with your interpretation and I love how you applied your Cards to what is actually going on in your life right now. I know you are only beginning to get your head around the Cards and all their meanings but you are doing very well. You came up with this interpretation without any input from me at all. I know you look up my course and flick through books we have in the house but I shall have to give you a Gold Star for your hard work. The King of Pentacles has come up for you on many occasions in the past and you are quite familiar with his implications. So too The Five of Wands in past readings but they were related to a completely different situation you were dealing with. However, their energies remain the same but it is how you apply them to your current issue that is important. There has been a mad flurry of activity around you for the last while in relation to house hunting. You have been on property websites, staring in windows of of Estate Agent’s offices and scouring the property section in newspapers. You have been pulled this way and that, flitting from one potential location to another, changing your mind and then changing back again. After the survey failed on the house you held so much hope for, you went into a little bit of a panic trying to instantly find another one to replace it. The Five of Wands shows this and the sudden moving of the goalposts in your life. You suddenly lost your sense of navigation and being a Pentacle yourself, Virgo, this left you very unsettled and contributed to the insomnia you have been experiencing. I am glad you have heeded the advice of The King of Pentacles and have decided to step back for a while and not think about property for another few weeks. Maybe, things will naturally settle now and the energy of the Five of Wands will head off across the hills and annoy someone else. You are right when you say The Five of Wands did not appear very negative to you and this is because it is the least offensive of The Five’s in that it is only a storm in a tea-cup and nothing to get terribly upset about. Buying a house is never going to be an easy process and there is going to be stress involved for certain. As you so regularly point out to me when I get into a heap about something ‘if you want to make an omelette, you have to break eggs’. I think that is how it goes anyway. As far as The Tower and Judgement are concerned I will get back to you about those but I would not worry unduly as they came in on top of all the stress and drama you are experiencing right now. However, they do have an important message and I will write about that another day. king of pentacles ,Billy may want a solid foundation ,just like… (king of pentacles).Any five of wands ,it’s like power game fire burning in him. this was a test of time.. any five’s I see is a negative talisman …Maybe some evil forces or negative energy was circling around that property..(survey engineers report did not go through ) This is Blessing welcome sign, he should be happy something better waiting for him….I also think billy needs to secure his finances ,not only for a house but also for business related matter..He may have to borrow extra money or settle for less …not a dream house but a small cottage………………(welcome posive) ( neglect negative )with in five years I can see very well established… Solid income solid house .. Yes, the house certainly had the negative aspect in relation to so many different problems that would need to be fixed and all fighting for priority (The Five of Wands).What do you fix first???? Too much trouble, possibly fixable, but too much trouble and also very importantly something the King of Pentacles would not like, is the dissipation of financial resources it would incur. 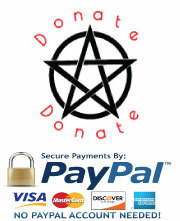 In The King of Pentacles we see him hold his golden egg, finances (pentacle) securely in his arms. He would be warning Billy not to part with any of it until there is absolute security and assurance that all is well. He would be warning against the possibility of further nasty discoveries on top of what was already there. Would he have enough money to cover these unexpected expenses? The King of Pentacles would walk away from such a high-risk venture and leave that to the likes of The King of Wands who would enjoy the challenge of it all or even The King of Cups who would make it a work of love, painstakingly renovating every corner of the house, throwing good money after bad, just because he liked the view out of the bedroom window. The King of Pentacles would be warning Billy about the need to be emotionally detached as much as it is possible when searching for one’s own property (if that is possible). At the end of the day, the figures have to add up, the practicalities have to be addressed and common sense must reign. Yes, he has borrowed extra money, but it may not be enough to secure the type of property he dreams of. You are right, he may have to borrow more (although I think the King would want him to save it rather than borrow it – stay away from increasing debt) or settle for less than his dream. A compromise. 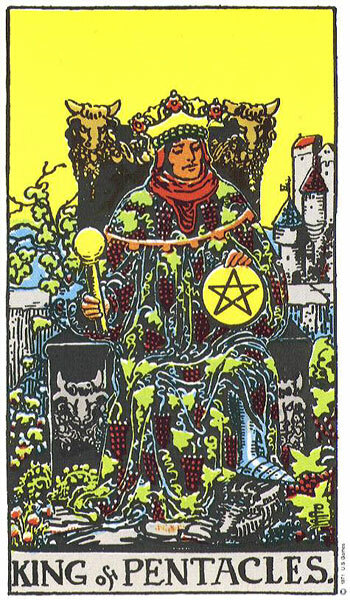 The King of Pentacles may also be suggesting he wisely invest what he has and sit on it for a while. He certainly is telling him not to rush into anything right now and to seek advice only from those who are professionals. 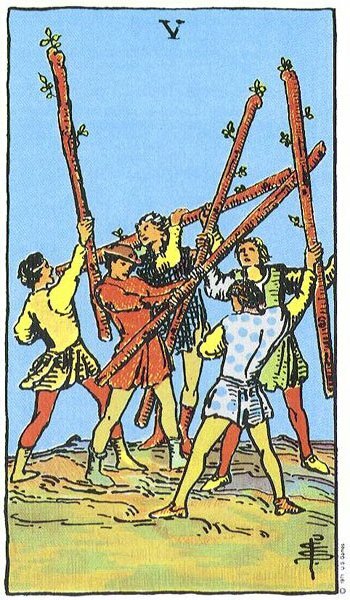 The Five of Wands seem to want him to make some kind of impulsive move and create an atmosphere of panic, as in the need to move fast because of competition for all available properties. The King of Pentacles tells him that it is all a lot of hype and hot air. Calm down, back off and wait. The best is yet to come. Even though the Five of Wands suggests a lack of team-work and scattered energy, it will all come together in the end once Billy allows the King of Pentacles to guide him through. Thank you for your interpretation and I have thrown mine in with yours. I see! Indeed, I will have to keep an eye on him and a look out for a Queen of Wands type trying to sell him more than a house. Billy will comment on this himself. Thanks for the tip!